Andersen’s Fairy Tales on Stamps. Slide show. It may be somewhat surprising to learn that a number of Andersen’s tales were published in America even before being published in Andersen’s native Denmark. According to Jean Hersholt’s introduction to The Andersen-Scudder Letters, University of California Press, 1949, ten tales were published by Horace Elisha Scudder, Andersen’s American editor, publisher and translator, in the above mentioned Magazine, in the years 1868-1870. After the Magazine closed down, Scudder published four other tales, in the years 1871-1873, in Scribner’s Monthly, an illustrated magazine for the people: “Lucky Peer” (in four installments), “The Great Sea-Serpent”, “The Gardener and the Manor”, and “The Flea and the Professor”. The hypertext of these four tales is based on the images found in the Making of America collection of Cornell University Library. 127 more tales are given in a hypertext rendition of Mrs. Paull’s nineteenth century translation, now in the public domain. Four more tales, contributed by Mike W. Perry and marked by a (*), are digitized from Fairy Tales and Other Stories by Hans Christian Andersen, revised and partly re-translated by W.A. and J. K. Craigie, Oxford Univ. Press, London, 1914. Mike also contributed the three tales marked by (**), from Wonder Stories Told for Children, Houghton Mifflin, Boston, 1900. The remaining 29 tales are given in title only, using Jean Hersholt’s translation, published in three volumes in 1942-49 by The Heritage Press, and now collectors’ items. The 30 most popular tales are marked by a . 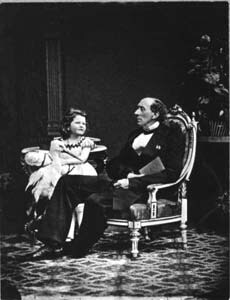 30 more tales, which Elias Bredsdorff, in his book Hans Christian Andersen: The Story of His Life and Work: 1805-75, published in 1975 by Phaidon Press and republished in 1994 by Noonday Press, considers most characteristic and representative, are marked by a . All these tales, and the 99 marked by a , may be found in the book The Complete Hans Christian Andersen Fairy Tales, edited by Lily Owens, published in 1981 by Avenel Books and republished in 1993 by Grammercy Books. Highly recommended contemporary translations of Andersen’s tales may be found in the following omnibus editions: Hans Christian Andersen: The Complete Fairy Tales and Stories, translated by Erik Christian Haugaard (1974, 156 tales); Eighty Fairy Tales, translated by R. P. Keigwin (1976, 80 tales); Hans Christian Andersen: Fairy Tales, translated by Reginald Spink (1960, 51 tales); Andersen’s Fairy Tales, translated by Pat Shaw Iversen (1966, 47 tales); Tales and Stories by Hans Christian Andersen, translated by Patricia L. Conroy and Sven Hakon Rossel (1980, 27 tales); Hans Andersen’s Fairy Tales: A Selection, translated by L. W. Kinsland (1959, 26 tales); The Stories of Hans Christian Andersen : A New Translation from the Danish, translated by Jeffrey Frank and Diana Crone Frank (2003, 22 tales). All the above books, and other books in English by or about Hans Christian Andersen, may be found in our virtual bookstore. Books in French may be found in our librairie virtuelle. 1868 Which is the Happiest? 1871 Dance, Dance, Doll of Mine! Andersen’s tales in this collection are illustrated by the “official” Andersen illustrators, i. e., the Danish artists chosen by Andersen to illustrate the collected Danish editions of his tales: The naval officer Lieutenant Vilhelm Pedersen (1820-59), who illustrated the 1849 edition (45 tales, 125 illustrations) and continued to illustrate Andersen’s work for the next ten years, and Lorenz Frølich (1820-1908), who illustrated Andersen’s work between 1867 and 1874. See also the chapter “Hans Christian Andersen and his Illustrators”, in Fairy Tales From Hans Christian Andersen—A Classic Illustrated Edition, Russel Ash and Bernard Higton (eds. ), Chronicle Books, 1992. See also the book The Amazing Paper Cuttings of Hans Christian Andersen by Beth Wagner Brust, Ticknor & Fields, 1994 (paperback reprint edition, 2003). 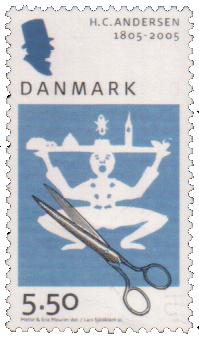 In 2 March 2005, the same paper cutting appeared on a Danish stamp issued for Andersen’s Bicentennial, to represent Hans Christian Andersen the artist. All the above books, and other books in English by or about Hans Christian Anderen, may be found in our virtual bookstore. Books in French may be found in our librairie virtuelle. Andersen’s 1875 photograph by Georg E. Hansen and many more are available from the Picture Database of the Danish Royal Library.